The Online Photographer: Rate Your P/S! Got 20 minutes to squander for zero real reason? Rate your point-and-shoot! Use the rating system in the "Building the Perfect Point-and-Shoot" post below and tell us how your p/s does. For Feature #4, award 3 points for each property. For Feature #5, a prime lens deserves a full 10 points if you ask me. How's yours do? Tell us. Canon A620 (discontinued; the direct successor is the A630): I score it at 60 points (70 if you use the freeware hack that allows for RAW capture). I've also concluded that the A620 really isn't a P&S; it's more like a bridge camera than the vast majority of metallic rectangles out there. But it fits in a jacket pocket and is a shockingly effective photographic tool with qualities that are completely out of proportion to its cost. I won't rest until everybody tries one! I like this game, even if my household P/S does quite poorly... this is the Canon PowerShot A80. 1. Size: I'll give it a 5. It's a bit thick. 2. MegaPixels: 4 megapixels. It's dated technology. Still, I've printed 5x7 from it that look great. I'll give it a 5 for being insufficient by modern standards. 3. Raw Capability: No, 0 points. 4. Waterproof: pretty robust, but not especially any of those things. 4 points. 5. Zoom Range: Pretty good, 7 points. 6. Reasonably Noise Free at 400 ISO: Nope. Zero points. 7. Articulated LCD: bingo! 8 points cuz it's quite small. 8. Optical Viewfinder: Yes, although it has the same limitations that all of these have, 7 points. 9. AS/IS: Nope, 0 points. 10. Fast: Nope, 4 points because I've seen worse. My P&S is a Canon G7. I know one could argue that it's not a P&S, but I use it that way. 0/10. No RAW is the main reason I keep looking at the alternatives. Solid build, but not waterproof. 6/10. Feature 5: A zoom lens of no more than 3X, 28–85mm equivalent, ƒ/2.8 or faster on the short end. 6X zoom is high quality and fast in this case, so I'm giving it 8/10. Feature 6: Reasonably noise-free to ISO 400. G7 actually does pretty well at ISO 400. Not too far behind my Fuji F30, so I'll give it 7/10. Feature 10: Must be fast, responsive, and very quiet, with excellent shutter lag and shutter release feel. I think this list should have included battery life, type of storage, image buffer, etc. Articulated LCD, number of megapixels, and fold zoom are not important IMO. Still, based on the given scale, I give my G7 51 points out of 100.
compact, but not really "pocketable"
5 megapixels is enough resolution for a fantastic 5x7 at ISO 100, and a decent 8x10. Built like a rock, but still not what you'd call weather-proof, shock proof, or freeze proof. I know it's a 4x (35-140) but the quality on the zeiss optics is REALLY strong. Just wish it was a bit wider. small, but fairly bright, with focus lock and flash verifaction. 10: Fast: 8 Really very fast autofocus, and terific shutter response if you pre-focus. 1) Size: 3, not pocketable. Great small body, great lens, aperture priority (on dial), +/- 2 EV correction (on dial), spot, snap mode, etc etc... Ricoh GR1 is all I need. Ever. Ok, I'll jump with my Fuji S5000 (a bridge camera maybe, but the G3 isn't a p&s neither. Feature #1: 3 points. It's not pocketable, but it fits in a very small bag. Feature #2: 4 points. It's a 3 mp SuperCCD, interpolating to 6. I've printed up to 8x10 with great results and to 12x16 with acceptable results. Feature #3: 10 points. Perfectly usable in RAW mode. Lightweight 4 mb dng files when converted. Feature #4: 5 points. It has more than 2 years of non-babying use, and it's solid. Feature #5: 10 points. Sorry, no prime-snobs here. A great, 2.8-3.2, 10x zoom, versatile. Feature #6: 0 points. Noisy even at iso 200. Feature #7: 0 points. Fixed one. Feature #8: 1 point. It has an EVF in case you feel you're not serious if you use the LCD. I love to use the LCD, and I'm pretty serious, believe me. Feature #9: 0 points. Would love to have it. Feature #10: 3 points. It's ok if prefocused, otherwise, slow. It seems this rating doesn't reflects my thinking, since I love the camera and I think it's a great photographing tool. A fun excercise nevertheless. What I miss on this camera is RAW and low noise at high sensitivity. I don't miss waterproof, articulated LCD or viewfinder. 1. Size: 10 - It's pretty small, but not so small that you can't hold it. 2. MegaPixels: 9 - It has 7MP, but I'd almost be happier with 6MP to help reduce noise. 3. RAW: 0 - not capable of RAW. 4. Durability: 9 - The 770SW goes deeper underwater and it's freeze-proof (unlike the 720). 5. Lens: 8 - 3X optical at f/3.5. Could be a little faster. 6. Noise: 7 - It's kind of a noisy camera to begin with. 7. Articulated LCD: 2 - It's not articulated, but it's 2.5 inches and pretty bright. 8. Viewfinder: 0 - No room for one. The LCD almost takes up the entire back panel. 9. Anti-Shake: 9 - It does pretty good for a little camera. 10. The Feel: 8 - It's actually pretty fast. Not SLR fast, but better than a lot of other cameras I've used. It's a pretty quick focuser too, not a lot of searching. I give this one 65 points. 1. Small but a little heavy (metal build), 8/10. 2. 6 MP, does that make 10/10? 4. A little shockproof, didn't freeze it: 3/10. 5. 3x Zoom, a bit wider would be nice. 7/10. 6. The king/queen of ISO 400. 10/10. 7. Articulated LCD: nope. 0/10. 8. Optical VF: nope. 0/10. 9. No IS, VR etc. But it works well on ISO 800, so 3/10. 10. Responsive, AF is OK. 8/10. I, too, miss battery life in the scores. The F30 gets 10 points for that because it goes for weeks on one charge. For optical VF yes/no, I would insert the word "usable" to earn points... compacts have had these peeping holes for some time now, do you consider them useful as opposed to LCDs? Sanyo W31SAII mobile phone with a 1.1 megapixel camera. #1: 10. Since it's built in a device I'd carry anyway it really doesn't get smaller. #2: 10. 1.1Mp is less then 8Mp. Way less. I should have bonus points for this. #3: 0. RAW? You're kidding, right? It does heavily compressed Jpeg, just like our forefathers decreed. #4: 6. I give 3 for shock proof (I've dropped the phone multiple times with no ill results). I award half points for the other two since it is fairly resilient and if it breaks I can go to the nearest AU store and pick up a new one for a symbolic sum. #5: 3. It zooms. Slowly. As in, about five seconds from one end ot the other. On the positive side, the wide end is really wide, not this mediocre normal many cameras have. #6: 0. ISO? To be sure, it does change sensitivity, and it it sort-of noise-free, but that is mostly an effect of heavily compressed Jpeg. #9: 0. Not a chance. #10: 0. I can have a quick cup of coffee while waiting for the shutter. Zooming, focus, screen update - you feel like you've entered Matrix 'Bullet time' as the functions all sloowly work to finish. Zoom takes five seconds, focus (which runs through the focus range, then decides where to go) takes about 3 seconds. The screen updates slowly enough I see "cascades" of motion running down the screen when I move the cam. And it's a phone, so it makes an unmutable little blingelingeling sound when you take the picture. So, 29 points. To be fair, though, you can prefocus which makes things easier, and you can even, amazingly, set the white balance manually. 10. Fast - 5 Lag is short, it has a hyperfocal mode, but shot to shot is slow. 7. Articulated LCD - 5 (nowhere else to put this - it has a gorgeous 3" LCD which is like composing on MF groundglass; visible in direct sun, too). 10. Fast - 3 One of the slowest cameras I've ever used. Makes up for it in image quality, though. Interesting. Even if we change lenses on the DSLR, we may gain stabilization etc - but we're still stuck at a max of 80 points. Ergo: there is no one perfect camera (though I'd say that new Canon 1DmkIII comes close at about 90 points, being let down by being the size of a small house). Canon G3. Well, I didn’t break down the scoring on my Canon G3 in the e-mail I sent to Mike, I see the rest of you did so I will follow up. By the way, is it a point and shoot? It is the way I use it. It is all preset. I point it and shoot it. 2. Mega Pixels. It claims 4, I guess that is better than 6 so I gave it an 8. 5. Zoom, it has one, a bit big so just a 7. 6. Noise at ASA 400. I make 5x7s and 8x10s. I don’t see no noise, but only an 8 cause I’m not sure of this. 7. Articulated LCD, Yep and it is big enough for me = 10. 10 Fast,yes if I pre-focus, quiet ? well I’m a bit hard of hearing = 8. E.
#1: 8 - shirt pocket but a little heavy. #2: 8 - 7.1MP, and focuses well. #3: 0 - No RAW ability, and limited JPEG controls. #4: 10 - THE waterproof, shockproof, freezeproof camera. What happens when you sit on your packet-sized 770SW? NOTHING! It's rated to withstand 100KG of crushing force. Two of my co-workers bought it sight unseen simply for its durability. Can I give it more than ten points for this one? Please? #5: 6 - it's not a silly range, but it's too long at the wide end. That said, my favourite lens is a 14mm-e.
#6: 6 - Noise, noise, noise... who cares about noise when you're thirty feet under water? #7: 4 - no articulated LCD, but pretty good viewing angles. #8: 0 - No viewfinder. But you can't use one when you're camera-tossing anyway. #9: 0 - No anti-shake. It would be nice. #10: 5 - It's decent for a P&S, which isn't great by SLR standards, but it usually does what I want it to. Total points... 47. That's funny, because I love this camera. 4. Waterproof usage possible only through a sold-separately housing. Mine's taken a few knocks, but I don't think it qualifies as shockproof. Minimum operating temperature is listed as 32. So 0 points here as well. So, it scores a 56. It's a good camera: the only things that I personally wish it had is anti-shake and RAW (not a fan of articulated LCDs, and I actually like having a little more reach on the telephoto end within the 3x zoom). 1. 10 points for shirt-pocket size. You could *lose* the thing in your shirt pocket! No, actually the size is perfect; you forget it's there. 2. 8 points for 8 megapixels. Given the system I'd have scored 10 for 6 mpx. 3. 0 points. No RAW. 4. 2 points for surviving in the rain on several occasions. I haven't dropped it, nor had the opportunity to freeze it, but I'm giving 0 points here due to my suspicions. 5. 10 points. 3x zoom with f/2.8 on short end. 6. 5 points. Not great at ISO 400, but not horrible for a P/S. I gave a nod in that the ISO starts at 50. 8. 0 points. No optical "peephole" nor viewfinder for that matter. 9. 10 points for SR (Shake Reduction). 10. 2 points. Fast? Not hardly. Responsive? No way. Very quiet? Yes it is (2 points here). Shutter lag? You betcha ... plenty of shutter lag! Release feel? I've learned to watch the lcd go black to know that I've succeeded in taking a shot ... there is little to no "feel". Perhaps it's been stated above, but Mike, you need to add points for manual mode. This camera doesn't it. It can be tricked, but that's a far cry from a dedicated manual mode. 4. 9 - It did have trouble when I had it in my pocket in an engine room in HI where the ambient temp was 130 F. I've deliberately tested waterproof and accidentally tested shockproof many times and have never had trouble in winter weather, either. 5. 8 37-104 f/2.8-f/3.9 I'd prefer wider. 8. 5 It's there, and I'm used to it, but it's tiny. Uses SD card as do my laptop & cell phone. Minus: No built-in lens cover. all kind of -proofs: not quite, but very solid build. 5/10. zoom: 28-90 F2-2.4. Can I score it 15/10? 10/10. ISO: well, ISO 400 is quite noisy, and worse, it doesn't have an ISO 50. 6/10. Articulated LCD - no; 0/10 (here we should score also the quality of an LCD. It's useless to have an articulated LCD if you can't use it properly). Optical Viewfinder - no 0/10 (although the EVF is quite good). Speed and responsiveness: well, that's pretty good, excepting those situation when you shoot RAW. 8/10. Hey, Panasonic, why didn't you continue this model? I want a 8 mpx. 16/9 sensor format, image stabilized LC2! 2: 0, 10 mpix, but good quality ones. 3: 10+, it has two raw formats. Go figure. 4: 0, well built but no special protection. 8: 5, EVF, hotshoe for external finders and corresponding zoom steps. 10: 8, the IS adds a bit of noise. Snap shot/infinity focus mode and a focus lock toggle makes it very responsive. That makes it 54, strictly graded. Just to clarify the Yashica T types. The one you pictured is a T4 Super which has a fixed 35mm (I think) lens while the T4 Zoom has 28-70mm zoom. I have the zoom version which suits me better but both would score the same if you give 10 to a fixed focal length lens. Either way, the results speak for themselves I think. I see the value of T4s going up on ebay. Actually i am very satisfied for what it is. I give my Canon A410, 3.2MP, 3.2x a whopping ten points for being built like a small brick, with a flat bottom - perfect for propping on tables, bollards, up-ended cups, walls, and anything flat and horizontal to make a rigid tripod. For static subjects, 80ISO and slow speeds are not an issue. so if my math is right, the best hands down P&S out there (for me) right now gets a .... 48! So is the "Canon PowerShot SD700 IXUS 800" the same thing as the Canon SD700IS? 1-Size: 5; not "pocketable" but fits a small fanny pack well enough. 2. Megapixels: 9; at 8mp it fits the spec though isn't your "perfect 6". 3. RAW: 10; you've got it or you don't. Only partial scores here should go to those that have some lossless non-RAW format. "JPEG-onlys" should only get zero. 4 x-proof: 3; not waterproof and, living in Key West, can't comment on freezeproof. It has an all metal body and is very shockproof when off (lens collapsed). 5 Zoom: 10; I still vote 10 even though its over the spec'd 3x limit since the extra range is on the wide end (24-85 equiv). Also, its f/2.5 at the 24mm equiv setting. 6 Noise @ ISO400: 5; Its decent and, having RAW, you've got some control in post-processing. 7 Articulated LCD: 10; excellent flexibility. 8 Optical VF: 7: Not fully optical but still eyelevel. The EVF is substantially brighter in low light than any, even Leica, optical VFs though it does have some lag. 10 Responsive: 6; its slow for the lame PHD (Push Here Dummy) users that can't be bothered to use focus trapping. When you trap focus, the remaining lag is small. 3 - 10 if you count negative film as a RAW mode! 4 - 5 Robust, but not weather resistant, and the winding mechanism can fail. 10 - not instant, but nothing is quieter. It's interesting to see how pople score their compact digital cameras. I'm so happy with my G3 that when my origianl one died. I bought another on eBay. I really think that the G7 with no raw is really a down grade. I don't know what Canon was thinking! I've made 13 x 19 prints from this 4 megapixel gem that are hard to tell from mu 30D at 8 megapixels. Excellent glass, movable lcd, optical finder, introvalometer, and as many adjustments as the 30D. All in a small compact package. Mini camera heaven!!! I give it a 100+!!! 1. A little thick, otherwise quite small. 8/10. 4. Nothing, thought teh build is quite nice for cheapo digicam. 1/10. 5. f2.8/32mm equiv, perfect focal length for me, though optically the lens is not fantastic. 9/10. 6. The sensor is plain crappy - storng NR right from ISO 100. No big noise at ISO, though no details too. Works as snap-shot digicam. 2/10. 7. No articulated LCD. 0/10. 8. Got one, typical PS viewfinder. 7/10. 10. Very fast AF! I use it prefocused at 1.0 m all the time - it's almost instant. 10/10. I'm hoping you're going to tell us what camera you're talking about...don't feel too bad, several other people have done the same thing. 1. Size: 10, fits in your pocket not to small to comfortably hold. 2. MegaPixels: 10 Huge MP, scan the film. 3. Raw Capability: 10, the original Raw. 5. Zoom Range: 10 for sharpness of lens, and as far as zoom goes, I have two legs. 6. Noise at 400 ISO: 10, have you seen T-Max? 7. Articulated LCD: 0 find a ladder or lay on your belly. 8. Optical Viewfinder: 10 Yes, and paralax corrected. 9. AS/IS: 0, control your breathing grass hopper or find a table to set it on. 10. Fast: 8 don't miss pictures. I think some finer grained definitions on your compact camera rating system would be helpful. Here's my attempt at taking more of the emotion out of these ratings. 1. 10 points for T-shirt pocket. 5 points for any other pocket above the waist. 0 for neck strap or coat pocket. 2. 10 points for 6 megapixels. For each megapixel above, subtract two points, For each megapixel below, subtract three points. 3. RAW is 10 points. JPEG or TIFF is zero. Any points other than 10 or zero means the rating needs to be done over. 4. 3 points for waterproof, 3 points for shockproof, 3 points for freeze proof. 1 point for all metal body. 5. Subtract 5 points for zoom range starting above 30. Subtract 1 point per 5 mm above or below 85mm. Prime below 30 has no penalty here. Subtract 3 points for each half stop smaller than f 2.8. 6. The two Fuji cameras (F30, F31fd) get a 10. Most cameras get a 4 or 5. Casio, Panasonic, and Olympus get a 1 or 2. Borrowing from Simon Joinson here, referenced in another TOP post. 7. Hinged LCD gets a 10. Everything else gets a zero. No points for big, bright, or clear LCDs. 8. Built in optical viewfinder gets 8-10. Optional optical viewfinder gets a 5-7. Everything else gets a zero. No points for big, bright, or clear LCDs. 9. Optical Image Stabilization gets a 10. The camera has to have an element, lens or sensor, that moves during the exposure. Everything else gets a zero. 10. 5 points for complete lack of sound. Fewer points for more sound. 5 points for less than 0.2 seconds shutter release. 3 points for 0.2x range, 1 point for 0.3x range. Zero points for 0.4 seconds or more. See chart referenced in an earlier TOP post. First, I will say that I think your scoring system is too much "something for everyone", and doesn't allow for personal preferences and requirements. For example, I want to give my camera 10 points for not having an articulated LCD. I've had two cameras with them, and while they were useful they do not fit with my conception of a point-and-shoot, which should possess the ultimate in simplicity. And you want to give another ten points for the optical viewfinder, which I won't argue with except to say that you ought to make up your mind. I also have had RAW in a point-and-shoot (in a Nikon CP-5700) and, although it was a nice idea, I absolutely never used it because the cycle time was horrendous. Does anyone make a p&s with raw that doesn't go out to lunch when you use it in raw mode? If I'm going to shoot raw I'll pull out my K-M 7D, thank you. Additionally, you've missed some things. For example, live histogram display. With the clipping problems on these tiny cameras, it is essential, as is a straightforward way to quickly run the exposure compensation up and down with instant feedback from the histogram. Yes, I know that this is part of what RAW is for, but see above. Also, decent flash power can be useful since these things are often used in difficult lighting situations, where fill flash can make a picture possible. I'll also say that my Casio, rated below, came with the nicest case I've ever had to keep a camera in. I find I appreciate that more than I'd ever have anticipated. If I had a different camera I'd likely miss it. I have a Casio EX-Z850, which isn't available anymore. On your scale I have go give it a 49, but I really don't think that does it justice. FWIW, here's a few pictures I took with it, that I quickly pulled out of my archive and adjusted only for brightness, contrast, color, etc. No claims on artistic merit -- they're snapshots, which is, for me, the whole point of this camera. Feature 1: 10 points. There are smaller cameras but I don't think that they are usefully smaller. This camera goes anywhere, in my experience. Feature 2: 8 points. It's 8 megapixels. As you said, 6 would be better. Feature 3: 0 points. No raw. I don't miss it. Feature 4: 5 points. I've never used it in a thunderstorm or in a deep freeze, but I've kicked it around a good bit and it remains in perfect condition. Metal case. Feature 5: 7 points. 3X zoom, f/2.8. Shifted a bit long from your ideal. Feature 6: 3 points. It starts to get noisy at 200. Feature 7: Nice, large, smooth, flat LCD on the back. Nothing to snag on anything or to break, it's always ready to slip into the case. Zero points on your scale, ten on mine. Feature 8: 8 points. It has one. It's little. It does zoom with the lens. I never use it. Feature 9: Zero. No anti-shake. I do miss that, having, as I mentioned, a K-M 7D. But when I was shopping for this camera, on my scoring spreadsheet, IS couldn't outweigh all the other disadvantages of the cameras available at the time. Pity. Feature 10: 8 points. I have no complaints. It's not a DSLR. 1) Can fit into a shirt pocket, no problem, but I wouldn't be super comfortable carrying it there, Although truthfully, it doesn't get a whole lot smaller than this. Score: 8. 2) Intentionally made sure to get a 6MP sensor for the same reason, score: 10. 6) Iso400? check and check. (Admittedly these are near ideal test cases, but check out the text in the first shot.) Even Iso800 isn't too bad either. Mostly it depends on your tolerance for noise. Iso1000 is hit or miss affair, mostly due to a saturation issue. Score: 9. Only because the Fuji is still probably technically better, although I find Iso400 perfectly usable on the Sony. 8) Optical viewfinder, check. Score: 10. 9) No stabilization of any kind. Score: 0. 10) "Performance" is a very subjective thing... Power on time is decent, but not class-leading. Shutter-lag is nearly non-existent, if it's pre-focused. AF speed is decent, but it won't win any prizes. Score: 7. A couple of things that swayed me to this particular camera not totally covered by the above: It has post-exposure and live-view histograms. 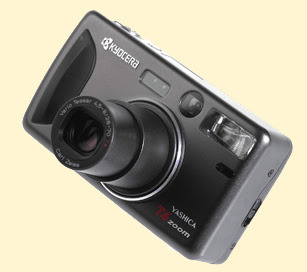 It has very good, for a P&S, controls with all the necessary shooting controls available (flash-mode, E/C). A/S modes aren't as useful as you might think if you've only got two actual apertures at every focal length and a double handful of shutter speeds. Judicious use of "sport" and "landscape" scene modes are almost as good. However, being able to access E/C and flash-modes without going into menus is critical. Manual focus is available--when looking for speed I'll set manual focus at about 3m for a larger room or 0.5/1m across a table and let DOF cover for any hit-or-miss focusing and lose the AF induced lag entirely. While lacking a RAW mode, you can control sharpening and contrast (+/- 1). I shoot everything with sharpening and contrast -1. I like it and love the hot shoe, 21mm equiv. converter, finder, lens shade, USB cable release. I wanted to like it and love the 19mm equiv. converter, EVF, lens shade, USB cable release - but the NOISE! Still, fun. Very small, metal, unobtrusive, expensive, better than Panasonic version but still too noisy. What about hot shoe as a feature? Image stabilisation overated - doesn't help if the subject is moving but lulls people into 'it'll do it anyway' thinking. 7. 0 - I actually disagree that this counts equally as the other factors - I don't want an articulated LCD as the additional bulk and weight is not worth it and I never use one with my shooting style. 10. 10 - absolutely fast. I like this camera more than 52 out of 100. Size/weight, responsiveness, and picture quality are the most important things to me in a P&S and this camera shines in all of those aspects. 2) 5MP. The difference between 5MP and 6MP on my two cameras works out to 256 px horizonatally and 132 px vertically. Score: 10. 3) IMO, it had bar none the best RAW handling non-SLR in its time. Think about how a dSLR handles RAW. I cannot emphasize enough how far ahead of its time the RAW handling capability was. Even now given how many manufaturers have been removing the feature altogether, I think the RAW capability of these two cameras A1/A2 has been at best equalled, never bettered. Score: an enthusiastic 10 points. 4) This camera is quite sturdy and I've used it all over with no hiccups, but again this camera has no special superpowers. Score: 0. 5) This model uses the same mechanically linked 7x 7-50mm f/2.8-3.5 (28-200 equiv) GT zoom as the original Dimage 5 series models. My only ding perhaps is that there's a noticeable amount of barrel distortion at the wide end, but that goes away quickly. I know this exceeds the 3x zoom range, but having shot with this lens as much as I have I can't feel comfortable giving it anything less than a 10. 7) The LCD articulates up for waist-level shots. But doesn't rotate side to side. Score: 9. 8) No optical VF. Score: 0. 9) AS-the first incarnation of Minolta-style sensor-based stabilization. It really works. Score: 10. 10) As far as speed goes... Start-up time was "competitive" at the time of release. It's probably quite slow now. At the time it was released it was in the top tier for AF speed. Even now it probably runs somewhere in the middle of the pack. No appreciable shutter-lag when AF is achieved. Digicams really don't make noise as long as you turn all the stupid beeps off. The only real niggling performance issue, buffer clear, was alleviated by a firmware update that Minolta released, shortly before they went under, that nearly doubled its write speed. The really important thing about the performance of the camera however, is not a tale told in just the performance numbers. The key point about the camera is that I'm never left feeling like I'm waiting for the camera. I've shot practically every one of my roughly 10,000 frames with this camera in RAW and I've almost never felt like I was waiting for the camera to catch up to me. How many non-dSLRs can you say that about? Score: 8. Just like the W30 there are some purely personal plusses: dual control wheels front and back, the Minolta-style "function wheel"+"button lock" control, the clever low-light black-and-white high-gain EVF mode, wireless flash commander capability, EVF-LCD auto-switching... you get the idea. The last personal plus, was the manufacturer: How many companies do you know of that will release a firmware "upgrade", not bug-fix, for a camera that's almost 2 years old??? The only downside to this camera was a crappy JPEG conversion engine. As stated above I got around this by exclusively shooting RAW. 10. Fast, quiet? 8. Reasonably so. Though this is no replacement for my Rollei 35S (black) with TMAX 3200 pushed 1 stop for nighttime candids, it does a nice overall job for a $250 micro digital that easily disappears in any bag or pocket.